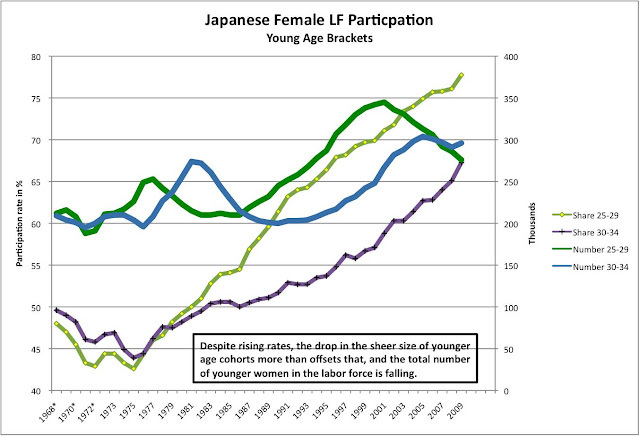 This is a data note linked to an ongoing discussion on the NBR Japan Forum. See the related post below (the oldest one on the blog). Female labor force participation has been rising monotonically in the immediate post-schooling age brackets, beginning with the age 25-29 cohort and now very visibly extending to the age 30-34 cohort. But let's not get too excited about this as a means to offset the rise in the number of retirees. [And as to that, the immediate post-WWII "baby boom" cohorts begin retiring en masse in 2012-2013: we haven't seen anything yet!] As the graph below highlights, while almost 80% of young women age 24-29 now are in the labor force, up 30+ percentage points from 1975, the total number of young women working is falling. 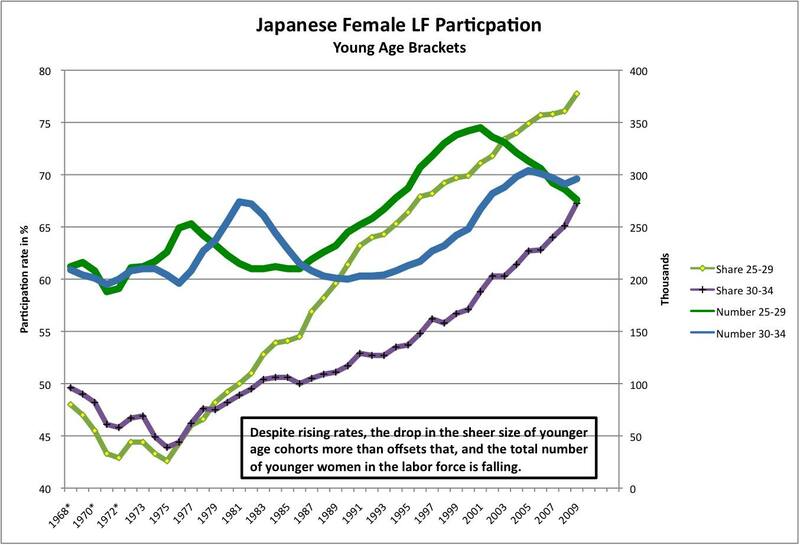 Rising female LF participation is unable to offset the absolute fall in the size of the labor force, it can at most slow it modestly. Yomiuri Shimbun reports a survey of 496 companies on starting salaries, which for new college graduates averages ¥207,445 per month [not including the normal 4-odd months of bonus]. Two-year college grads start at ¥173,828; high school grads at ¥162,749. All three are essentially unchanged from the past year. Now think of the normal opportunity cost calculation: how much is an extra year of schooling worth, relative to the pay you get? Jobs of course aren't identical, and neither are subsequent pay profiles. But if you have get-up-and-go, what decision would you make? Any implications for how you'd approach your educational choice? -- more later on what has in fact happened over the past 25 years. Or try to look it up yourself—data are not hard to find. This snippet (maybe it shouldn't be called a "story") does not give information on variance; take my word that it is low. (Hunt and you'll likely find a breakdown of these 400-odd firms by industry.) Some offer a bit more than average, some a bit less, but no one is 50% above average. To my knowledge, this lack of variance continues to be the case until the first real promotion, typically around age 30.